Recently read, there is little I can add to 50 Watts’ enthusiasm (here) for Goose of Hermogenes, one of those discards found in the dollar bin of my local bookstore, landing there because the casual browser failed to see its worth, a diamond in the dung. 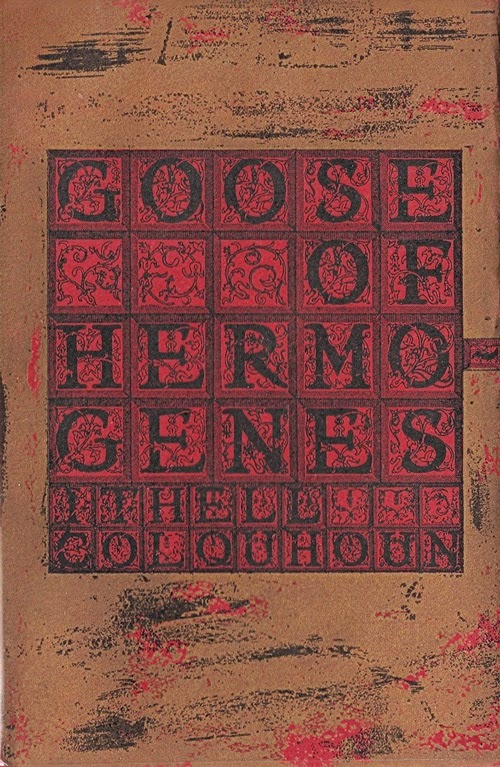 Steeped in surreal and occult imagery which seems to have come to Colquhoun as easily as breathing, it is a deceptively short text which calls for re-readings, a characteristic it shares with Gracq’s Chateau d’Argol and Kubin’s The Other Side (another work by a predominantly visual artist). This is the relation of a young woman's trip to a dreamy and forbidding coastal island, a transitional space between the worlds, ruled by the narrator’s uncle. The uncle being an elusive but omniscient presence, an occult Prospero, the narrator is left to explore the secluded mansion and its environs. There is a true sense of isolation and menace, broken by visions (a sea-Amazon arising, with an ancient underwater kingdom, from the waves; an arboreal bordello where her enslaved sisters service spirits of the netherworld), a tableaux of Tarot imagery, wherein her uncle has collected the symbols of the minor arcana, the “Museum of the Mosaico-Hermetic Science of Things Above and Things Below”, and the occasional presence of a mysterious anchorite who acts as her keeper and protector. If your tastes run to the occult or surreal, watch the dollar bins for this little masterpiece, or order your own from a semi-reputable dealer. Memoirs of My Nervous Illness by Daniel Paul Schreber. A 1903 first person account of schizophrenia by a institutionalized German jurist, fascinating (if tiresomely repetitive) in its description of paranoia and hallucinatory obsession as Schreber describes the psychic assaults of supernatural beings that are transforming him into a woman. The oppression by both his imaginings and the asylum staff are palpable, giving a certain poignancy to the writing. This memoir was influential on Freud’s thinking, misguided as it was (Freud never bothered to meet with the author in person, although such a meeting would not likely have been too difficult to arrange). The New York Review Books edition includes introductions, appendices and notes relating to Schreber’s case. Lud-in-the-Mist by Hope Mirrlees. A volume in the Millenium/Gollancz “Fantasy Masterworks” series, a novel of Faerie written in 1926 the protagonist of which, Nathaniel Chanticleer, may well put you in mind of another who puts comfort aside for the necessity of adventure, Mr. Bilbo Baggins of Bag End. One may also be put in mind of John Crowley’s enchanting 1981 iteration of the theme, Little, Big.